One of the biggest enemies of keeping either a pantry or food storage is pests. Little bugs that hitch a ride home in the bag of food you’ve bought and before you realize it, they’ve eaten some but spoiled much more. It doesn’t matter if you only have enough food for a week or if you’ve planned for months. Once pests take hold in your home they’re very destructive and it’s extremely difficult to kill them all. They reproduce worse than rabbits and rats combined. In one or two weeks you can find a lot of food wrecked and have a problem you can’t easily get rid of. Once they get into your house it is almost impossible to get them out. They have an uncanny ability to hide and reproduce in places you couldn’t imagine and eat things you would have never assumed were bug food. Roaches have a reputation as being indestructible, but these little bugs are just as tough. The most helpful way to prevent these pests from entering your home is three-fold. First, only purchase sealed packages instead of buying from the bulk bins if it isn’t an item you could freeze. Because most companies are very careful about avoiding infestations, this lessens the chances that something is carrying eggs when it arrives to the store. Second, bring the groceries in the front door, walk straight to the freezer and drop all flour, grain, pasta or bean-containing products in there for 72 or more hours, no matter their source. That will kill anything living and most of the eggs. After three days, pull the items out and allow them to come to room temperature without opening them (this avoids condensation), then package them appropriately for storage. Some people freeze for 72 hours, thaw and allow to sit for 2-3 weeks then check for bugs before moving to storage. Some eggs can withstand the deep freeze and you can’t kill those pests until they hatch. Giving them enough time to hatch so you can check the product before storing it prevents this problem. I’m not that organized to be able to do it that way and I’ve never had a problem with anything frozen once subsequently hatching out creepy crawlies. Therefore, I employ strategy number three to solve that problem. Finally, the third important means of prevention is to store everything bugs might want to eat in something they can neither get into nor out of. You want to use airtight containers so they can’t escape, can’t invade and they only have so much oxygen before they run out. That way if you do wind up with bugs, it’s limited to just the mason jars or tupperware containers holding that one item. You can walk outside and dump them directly into the trash can instead of having to institute a battle plan. So freeze, thaw then immediately store in glass or another sealed container to prevent them for arriving and having the ability to spread. It will eventually happen, no matter how hard you try. One will hitch a ride home on a piece of cardboard or a container or some other way you didn’t detect once it crossed your threshold. You’ll see one little moth float by while cooking dinner and you’ll hope he’s alone. And you’ll be wrong. He brought his extended family and all of his buddies, the others just haven’t had their flight plan cross your attention span yet. So when you do see your first moth or bug, I recommend you have some appropriate traps on hand so you can whip them out and begin the battle. Our buggiest battle here at home is pantry moths. In order to deal with them, I recommend you have some pheromone moth trapson hand. They’re easily available at home and garden stores and stores like Ace Hardware or Lowes/Home Depot. They aren’t badly expensive, either. When you see your first moth, put a trap out. They have a six-foot radius and last up to three months, so it’s cheap insurance against getting your food destroyed. They really do work well. Within 10 minutes of setting one out, you’ll see moths stir and start looking for it. Because they are phermone-based and are glue traps, they don’t pose a risk to you. They do not involve poison. The moths are attracted to the scent and get stuck to the trap. When you do see them, it’s also a good idea to make any grain that is not in a sealed container go another round in the freezer. Then check all of your sealed containers to make sure none of them are also involved. Invest in a fly swatter to kill any that you see. It’s also a good idea, if you’re going to store grain, to take out some added insurance for your clothing in the form of cedar. If you wind up with pantry moths, they will also eat anything wool in the house. You’ll have holes in your sweaters before you even know you had some uninvited company in the bedroom. I’ve also heard of adding food grade diatomatous earth to grains. It is edible and won’t add any flavor to your food. I haven’t tried it. I just store all my grains in gamma lid sealed 5 gallon containers. 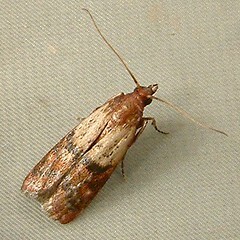 I didn’t know that pantry moths ate wool clothing, how aweful!